Glycogen synthase kinase-3 (GSK-3) is a protein serine kinase that phosphorylates glycogen synthase and thereby inactivates it. Insulin stimulates the dephosphorylation of glycogen synthase at the sites phosphorylated by GSK-3 and subsequently inhibits GSK-3 acutely leading to the stimulation of glycogen synthesis. 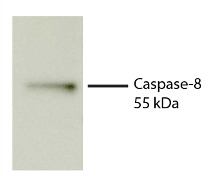 GSK-3 signaling is performed by two isoforms, GSK-3α and GSK-3β. The two isoforms share 97% sequence similarity within their catalytic domains. 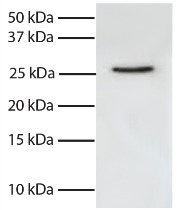 GSK-3 has also been shown to play a role in protein synthesis, cell adhesion, cell proliferation, cell differentiation, microtubule dynamics, and cell motility. 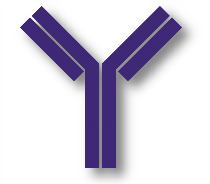 GSK3α was immunoprecipitated from total cell lysates from Jurkat cells with Mouse Anti-GSK-3α-UNLB (SB Cat. No. 10910-01). 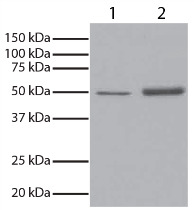 Total cell lysates from Jurkat cells (Lane 1) and immunoprecipitate (Lane 2) were resolved by electrophoresis, transferred to PVDF membrane, and probed with Mouse Anti-GSK-3α-HRP (SB Cat. No. 10905-05). Proteins were visualized using chemiluminescent detection.